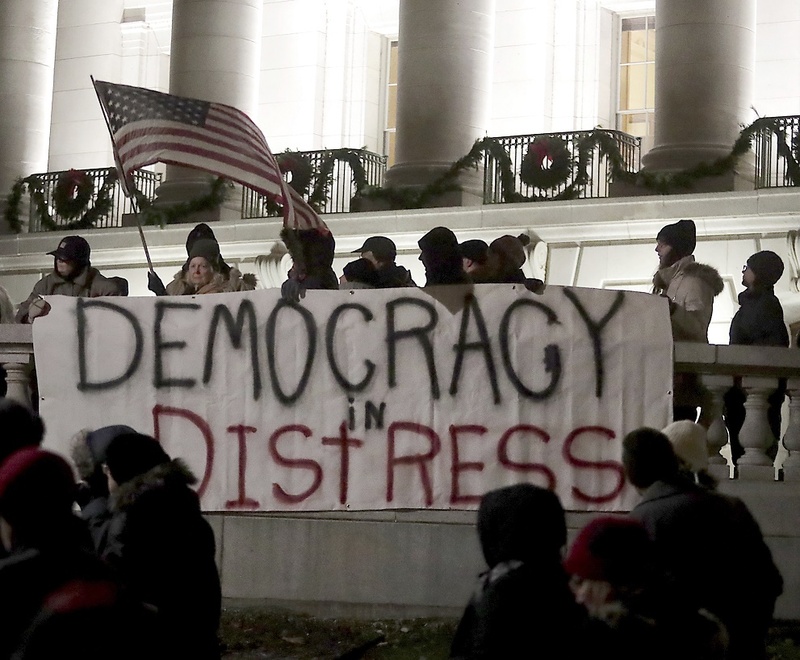 MADISON, Wis. (CN) – An effort by Republican lawmakers in Wisconsin to limit the power of the incoming Democratic governor and attorney general were put on hold Tuesday afternoon when the state Senate quickly recessed after angry protesters had to be cleared from the gallery. Senate President Roger Roth, R-Appleton, issued repeated warnings to the agitated crowd in the gallery that he would have to clear them out and leave the Senate standing informal, which is just what happened after his third admonition. Tuesday’s Senate vote comes during several days of controversy in Wisconsin after the lame-duck session was announced Friday afternoon and 141 pages of bills were introduced, a rush of Republican-backed legislation seeking to make large-scale changes to curb the powers and alter the complexion of the duties for Governor-elect Tony Evers and Attorney General-elect Josh Kaul, both Democrats. The extraordinary session comes less than a month after Evers and Kaul were elected to office, defeating Republican Governor Scott Walker and Attorney General Brad Schimel. Preceding the vote on the Senate floor was a Monday hearing of the Joint Committee on Finance to approve the bills on their way to the Legislature. The hearing began just after 1:30 p.m. local time and lasted until midnight. Despite how rare extraordinary sessions are, Republicans on the committee, chiefly co-chair Reprepresentative John Nygren, R-Marinette, compared this week’s session to one held in 2010 just before Governor Walker took office, when Democrats unsuccessfully tried to approve a set of union contracts while Democratic Governor Jim Doyle was finishing out the remainder of his term. Not present at Monday’s hearing were Assembly Speaker Robin Vos and Senate Majority Leader Scott Fitzgerald, two Republicans considered the central architects of the lame-duck legislation. After that 10-hour committee hearing, which included over five hours of testimony from members of the public, the committee approved three of the five proposed bills, voting 12-4 along party lines. The bills up for a Senate vote would put the state employment agency out of the governor’s control. They would also weaken the state attorney general by allowing legislative leaders to intervene in legal cases with their own counsel, and requiring legislative committees to approve any state withdrawal from federal lawsuits – like a multi-state conservative effort to kill the Affordable Care Act. One measure that did not make the final cut was a controversial plan to move the date of the 2020 presidential primary from April to March. It was seen by critics as being a barely veiled attempt to protect the re-election of conservative Wisconsin Supreme Court Justice Daniel Kelly, who would have theoretically benefited from being on an April ballot separate from the primary, where Democratic turnout is expected to be very high. That proposal would have cost taxpayers an estimated $7 million, and the state Elections Commission adopted a unanimous stance saying it would be “extraordinarily difficult” hours before the committee convened. Sixty-four of the 72 Wisconsin county clerks, a handful of whom testified at Monday’s committee hearing, opposed the measure, claiming it would cause logistical nightmares for election officials and disruptive voter confusion. The central thrust of how the other bills aim to put hard checks on the ability of Evers and Kaul to undo work done by the GOP-majority government, however, is intact. One of the marquee measures putting a damper on the attorney general-elect is a provision in one of the bills that allows GOP legislative leaders to intervene in the state’s lawsuits and hire teams of private attorneys for representation at taxpayer expense. Typically the attorney general represents the state in court. This has drawn renewed attention to the decision by Governor Walker and AG Schimel allowing Wisconsin to join other states and attorneys general to challenge and gut the Affordable Care Act, better known as Obamacare, the signature legislation of former President Barack Obama. One of Kaul’s signature pledges on the campaign trail was to withdraw the state from that lawsuit. The proposed legislation also weakens Kaul’s office by taking away its power to decide how settlement money received by the state is spent and giving that power to the GOP-controlled Kegislature. One of the bills’ other measures would hamstring Evers’ ability as governor to appoint board members and a chief executive to the Wisconsin Economic Development Corporation, or WEDC, a controversial hybrid public-private jobs agency created under Walker that Evers campaigned on dismantling. Other legislation provisions would require Evers to get permission before banning guns in the state Capitol, eliminate the Wisconsin Justice Department’s solicitor general’s office, and require Evers to report if the governor pardons anyone or his aides release anyone from prison. Wisconsin Republicans have also sought to limit early voting to a two-week window. A similar limit on early voting was found to be unconstitutional and racially discriminatory by a federal judge in 2016, and Democrats have all but promised to take legal action again. Nygren, the Republican committee co-chair, claimed at Monday’s hearing that the proposed early-voting limit is designed to increase fairness to rural counties whose polling locations are not staffed as often and have fewer resources than urban parts of the state like Milwaukee and Madison. 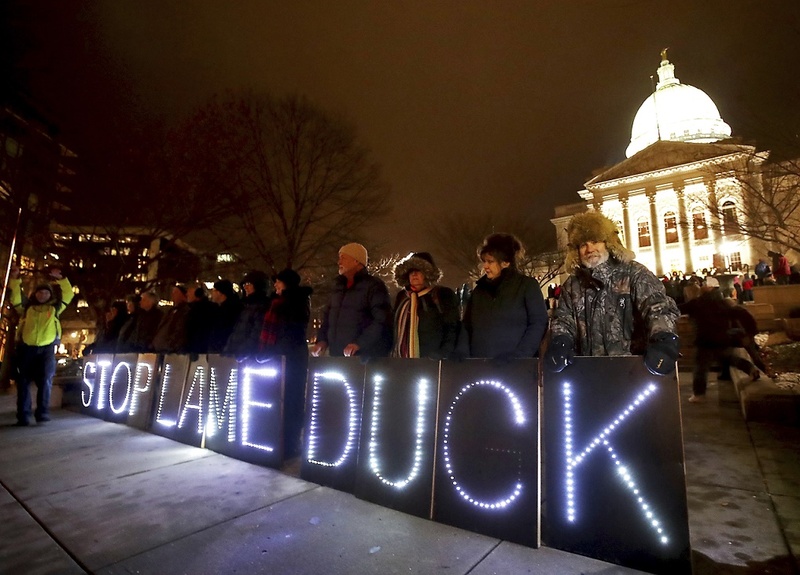 The fast-paced legislative maneuvers made in the lame-duck session have brought back to the surface statements made by Assembly Speaker Vos the day after the midterm election, when he was quoted as saying that “maybe we made some mistakes giving too much power to Governor Walker” and that he and the Legislature would looking into changing that. The rancor in Madison is the most acute since Walker signed into law his signature Act 10, which drew days of demonstration in February 2011 for the limitations it placed on the collective-bargaining rights of certain public sector unions. Evers and Kaul will officially take office on Jan. 7, 2019.